Washington State Pavilion, with U.S. Pavilion reflected in its enormous multi-paned glass front. From its Opera House and Exhibition Hall to the Open Mall, the Washington State 200,000 square foot Pavilion is soaring, distinctive and versatile. 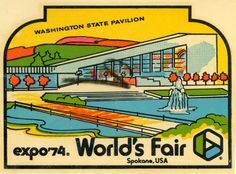 The Washington State Pavilion is one of the outstanding highlights of the planned World ecological exposition proposed for May 1, 1974 in Spokane. 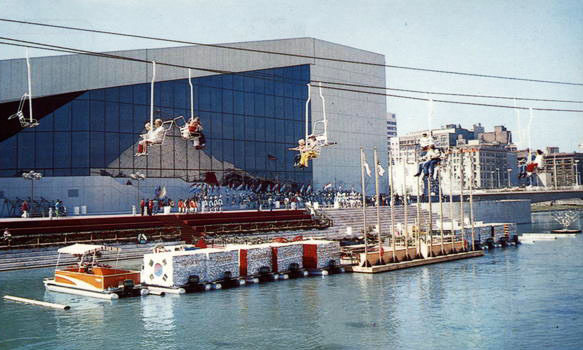 The building is a combined performance arts center and exhibit hall. The proposed cost is $7.5 million in state funds. Designed and engineered by: Walker, McGough, Foltz & Lyeria, Architects and Engineers. Compliments of Seattle First National Bank, Spokane, WA.